The Ezo deer (a subspecies of Sika deer, Cervus Nippon, which can be found throughout Japan) populates every region of Hokkaido with its main habitat in the eastern areas (Tokachi, Kushiro, Nemuro, and Abashiri). Males grow to be 90-190 cm tall and weigh 50-130 kg, while females grow to be 90-150 cm and 25-80 kg. Its summer coat is a light brown and its winter coat a dark gray-brown. The Ezo deer remain secluded in the forests during the day but often go out onto the grassy plains at night to feed. 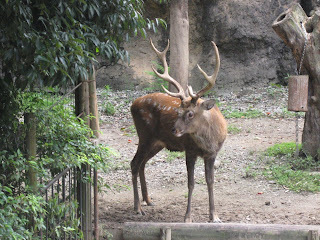 At one point, due to heavy snows and over-hunting in the early Meiji era (1867-1912), Ezo deer were near to extinction. Institution of protection policies and the resultant improved conditions of their habitats led to a dramatically resurgence of the population and range of distribution. A little over 40 percent of automobile and train collisions with Ezo deer occur in autumn and winter. - They begin migrating in groups to their winter habitat in November and December. - Because the sun rises late and sets early in the autumn, the hours when deer are migrating overlap with the hours when human commuting is most intense. - Establishment of the Shari Eco-road (a deer pass): underpasses designed for use by wildlife. - Maintenance of accident-prevention facilities, such as crossing facilities (deer passes, overpasses, etc. ), reflecting boards and fences to prevent deer from coming onto roads, and warning signs to alert drivers. Concerning crop damage, aside from accounting for about half of the damage to pastureland, Ezo deer continue to ravage sugar beet, wheat, white potato, and paddy rice crops. In terms of forestry damage, about 96 percent of damaged areas are tree nurseries, and aside from the damage caused by grazing on the young, reforested tree saplings and new leaves, Ezo deer also strip the bark from trees by scraping their antlers along the trunks. In natural forests, deer grazing adversely affects Japanese elm, Laciniate elm, Ezo-itaya maple, Japanese yew, and other trees. Due to a high fertility rate among female deer over age two and the decreasing mortality rate among Ezo deer resulting from warmer winters in recent years, the deer population will increase rapidly, at about 15 to 20 percent annually if Ezo deer are not hunted. (Meaning that the population will double in four to five years!) Furthermore, because its diverse diet includes most varieties of plant life, and its main habitat is in peripheral areas of the forests, the feeding habits of Ezo deer can easily come in conflict with the interests of the agriculture and forestry industries. - Building of electric fences and net fences to keep out deer. - Hunting to thin out the deep population. - Use of chemical repellants in painted or sprayed form to prevent damage to new and young forestry replantings. In order to provide for the effective use of meat from hunted deer, the Plan for the Management and Protection of Ezo Deer (Hokkaido, 2002) encourages efforts to improve facilities for the sanitary butchering and distribution of deer meat. * Eco Network, ed. Hokkaido mori to umi no dobutsutachi [Animals of Hokkaido's Forests and Oceans], Hokkaido Shimbun Sha, 1997. * Doto chiiki Ezo shika hogo kanri keikaku [Plan for the Management and Protection of Ezo Deer in Eastern Hokkaido], Hokkaido, 1998. * Ezo shika hogo kanri keikaku [Plan for the Management and Protection of Ezo Deer], Hokkaido, 2000.